Apps4Rent, the company behind CloudDesktopOnline.com, offers a wide choice of affordable and easy-to-use Hosted Desktop solutions based on Microsoft and Citrix technologies. 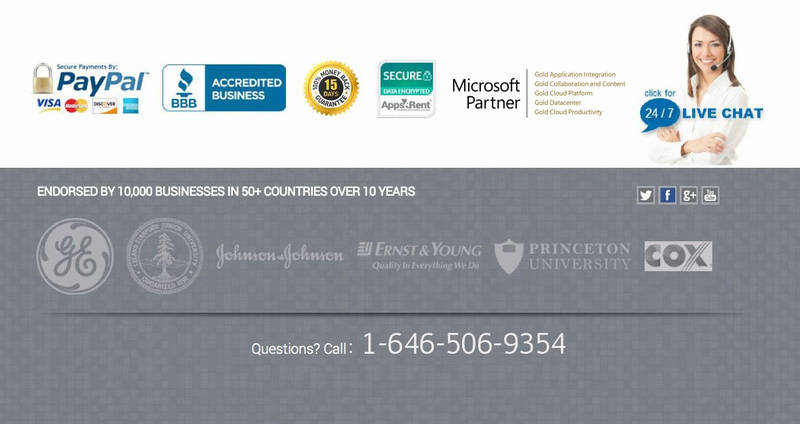 Apps4Rent, a Microsoft Partner with Gold level certification in “Hosting” and “Collaboration and Content”, staffs an experienced and responsive team that has provided managed services and Microsoft applications hosting to over 10,000 organizations over a decade. Hosted Desktops make it easy for organizations to deploy, maintain, and manage the task of providing their employees with anytime, anywhere access to desktops, applications, and files. Dependency on internal IT teams is also greatly reduced, as the hosting provider takes care of all maintenance and updates, hardware/software upgrade and backup responsibilities.With a hosted Desktop, you can look forward to some very tangible benefits that include enhanced end-user productivity, better disaster recovery capabilities, greater IT flexibility and improved security and compliance. Besides, moving to a hosted desktop means having multiple programs, working on multiple devices, flexibility of work location, and a sense of security. And it saves you time and money as well. With our Hosted Desktop offerings, you can securely access the desktop and the applications installed on it, anytime anywhere from any device. Applications installed on these desktops can easily be accessed from any device even via a browser. Deliver platform-independent access to your applications from anywhere on any Windows, Apple, or Android devices (smartphone or tablet), dumb terminal/thin clients, or any browser. Install custom applications for legal, finance, accounting, engineering, design and other functions; get 24 x 7 access from anywhere and any device including a browser. Provide a consistent and familiar user experience and desktop profile for every employee through a browser in a totally secure manner. Implement your desktops and applications via templates to save time and resources of your internal IT team, in terms of procurement/setup. Move your desktops to our environment to save more than 50% when compared to other providers; also easily scale up and down as needed. Reduce the establishment and management overhead costs of desktop infrastructure by outsourcing support and maintenance functions. Shift your traditional capital expense IT model to a pay-as-you-go model with no long term contracts and enjoy simple, month-to-month billing. Eliminate the costly and lengthy hardware/software procurement cycle by providing on-demand cloud support for users across all devices. Benefit from our services offered via SSAE16 certified datacenters, with end-to-end encryption between your users and the Virtual Desktop. Provide access to desktop and all applications from a secure, well-managed environment and control data with your existing security policies. Prevent data compromise due loss of laptop or other devices, as all your data is virtual in a secure environment, accessible only with right credentials. Get the ability to meet stringent compliance requirements, including industries such as healthcare, legal, financial, engineering services and more. Restore your users to previous state from backups real quick and easy, since we perform daily incremental and weekly full backups. Avoid costly business disruptions as our virtual desktops are always accessible from any location with internet connectivity, anytime. Be assured as all you data is backed up off-site in the event of theft, device damage and even unforeseen natural calamities and events. Ensure 100% effectiveness of the technology part of your business continuity plan; easily recover from software corruptions/hardware disruptions.